Westmed Medical Group is an award-winning multispecialty medical practice, staffed by a team of 500 top physicians and advanced care providers, and 1,200+ clinical employees who are all dedicated to partnering with our patients in their comprehensive, lifelong care. Our focus is on the complete care of our patients. We believe that the convenience of our all-encompassing medical facilities provides a superior patient experience, more accurate and timely diagnoses, better communication, more effective treatment plans, and ultimately improved health for the patients and communities we serve. The foundation for quality healthcare at Westmed Medical Group starts with the patient experience. As a Level 3 Certified Patient-Centered Medical Home, our focus is on the complete care of our patients-treating you when you are sick, but also giving you the support you need to you stay well. In addition to a suite of more than sixty medical treatments and services, Westmed has six Urgent Care Centers across Westchester and Fairfield counties, that offer access to care for non-life-threatening medical needs every day of the week. Each location offers advanced laboratory, imaging, and radiology services, helping our integrated team of physicians, nurse practitioners, PAs and staff make a prompt and accurate diagnosis for our patients. To be your trusted partner in comprehensive, lifelong care. Westmed Medical Group is a large, award-winning multi-specialty medical practice, with headquarters in Purchase, NY. It is staffed by a team of over 500 Physicians & Advanced Practice Providers who are dedicated to providing coordinated, efficient and the highest quality of patient care at its 13 locations in Westchester County, NY and Fairfield County, CT. The practice, known for its one-stop-shopping medical experience for patients, uses state-of-the-art systems and has a national reputation for measured healthcare excellence. Westmed offers 60+ medical specialties and currently has over 1,000 employees. 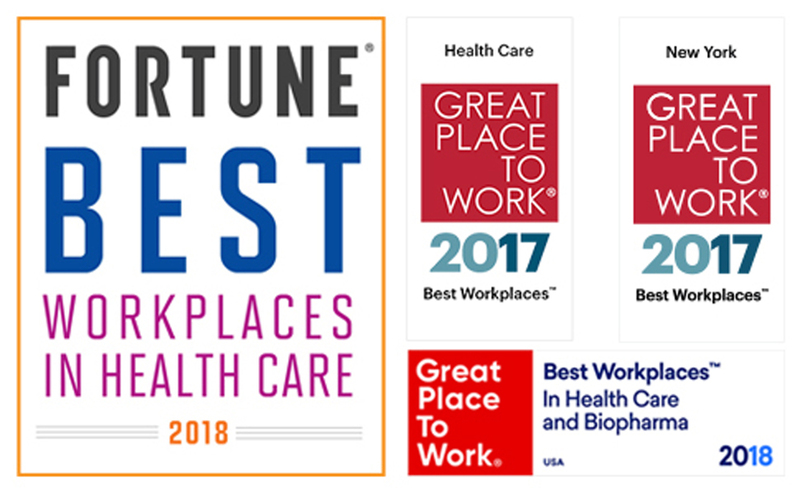 Westmed has been one of 480 Medicare Accountable Care Organizations (ACOs) nationwide since 2012, and was ranked a Fortune® Best Workplaces in Healthcare (2017 and 2018) and in New York State (2017).